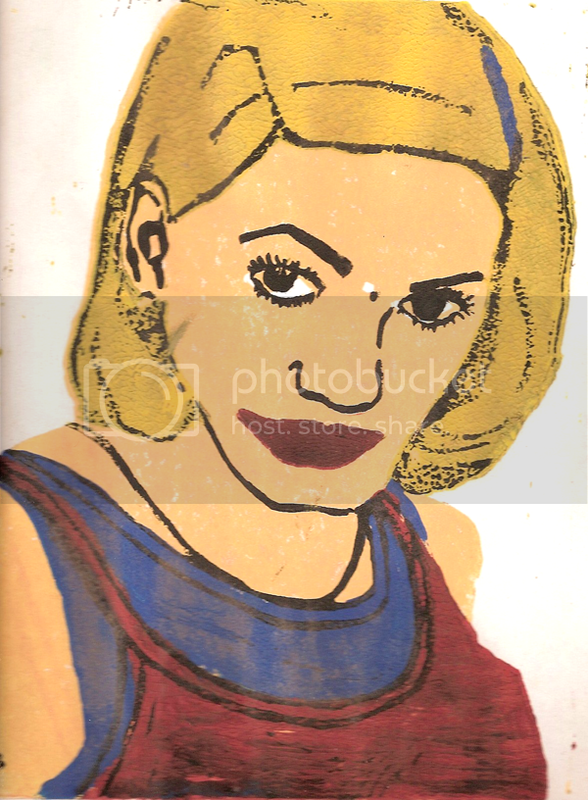 High school art class, 1996-ish. Mr. Roten, a talented artist (now a composer and rock guitarist!) and one of my all-time favorite teachers, started a unit on printmaking. It was messy and more than a few of us had to patch up our gouged hands, but... I loved it immediately. 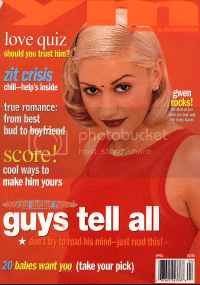 My inspiration piece: a YM magazine cover of Gwen Stefani. I STILL have it! That's the finished print in the middle. It was a five color reduction print with custom mixed inks. I'm not sure if you know anything about printmaking, but that's kind of intense. I knew NOTHING about it then so it sounded like a perfectly reasonable undertaking. Now it seems crazy intimidating! I still remember the look I got when I suggested it... "You want to do FIVE colors?!" And so I did five colors while everyone else did one or maybe two. And it took me forever. And I was hooked. After many years of storage and moves and crappy care, it looks pretty terrible now. It's smeared and mildewed, but it inspires me. I've started carving another multi-color reduction linocut but haven't worked up the guts to start printing it yet. Hopefully soon. After that first go, I tried a few other printing methods, most of which I hated. Intaglio? Super hated that. I'd really love to try screenprinting at some point, so if anyone has classes or instructors to recommend, let me know!